• A top DEA agent who hunted El Chapo says Sean Penn should be in jail for interviewing the drug kingpin just as the feds were closing in on him. • The Commonwealth of Virginia has been thrown into a state of chaos over recent blackface and sexual assault scandals. • A top police union blasted the NYPD for allegedly hiding the MS-13 gang member suspected in the weekend murder on the 7 train. 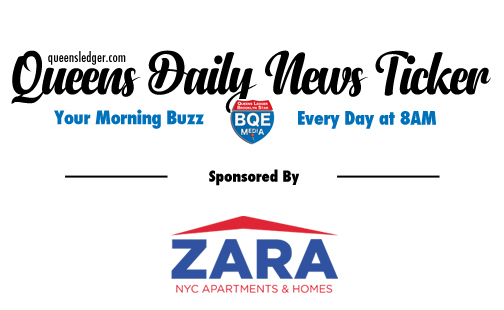 • Two members of a Queens-based drug crew called “Black Rain” were arrested for their connection to a 1992 murder in South Ozone Park. • The mayor’s controversial waterfront streetcar connecting Queens and Brooklyn took a step forward yesterday with the hiring of a new consultant. • The candidates in last night’s public advocate debate spent much of their two hours criticizing the deal to bring Amazon to Queens. • Meanwhile, Councilman Jumaane Williams was attacked for his controversial view on marriage equality and abortion at last night public advocate’s debate. • The Post says Jimmy Kimmel and Jimmy Fallon have been silent on the issues in Virignia because of their own uncomfortable past with blackface. • Former “Fixer Upper” star Joanna Gaines has just penned her first children’s book. • In 1964, The Beatles arrive in New York. • In 1965, comedian Chris Rock is born in Andrews, South Carolina. He created and narrated this TV series, which was based on his youth. • A columnist for the Greenpoint Star mourns the loss of neighborhood mainstay Enid’s. • A business owner on Long Island explains in the Queens Ledger how congestion pricing will help his lighting business. • At next week’s Community Board 5 meeting, members will discuss a proposal to build a daycare near a potential homeless shelter in Glendale. • Congresswoman Grace Meng invited the first DREAMer Rhodes Scholar to this week’s State of the Union speech. • A real estate expert based in Forest Hills explains the easiest ways to leave real estate to you children when you pass away. • Sold – Three-bedroom, one-bath, 1,260-square-foot single-family home at 117-35 227th Street in Cambria Heights for $512,000. • Here’s the best pop-ups and parties for New York Fashion Week 2019. • And Page Six Style goes back to the 2000’s to see Fashion Week looked like almost 20 years ago. • Corona – 11:30 a.m. – Borough President Melinda Katz attendsd groundbreaking ceremony. Make the Road New York Community Center, 104-19 Roosevelt Ave.
• Flushing – 11 a.m. – Congressman Joseph Crowley donates his congressional papers. Queens College, Rosenthal Library, 65-30 Kissena Blvd. • Whitestone – 1:30 p.m. – Elected officials discuss inequities in state education budget. Queens Library, 151-10 14th Rd. • LIC – 6 to 9 p.m. – Pups & Pints Fundraiser. LIC Bar, 45-48 Vernon Blvd. • Queens Village – 6:30 p.m. – Councilman I. Daneek Miller Discretionary Funding Workshop. C.W. Mixon Center, 112-50 Springfield Blvd. • Floral Park – 7:30 p.m. – Queens Village Republican Club Meeting. Flavor of India, 259-17 Hillside Ave.
• Forest Hills – 7 p.m. – A Heart’s Desire – Wine pairing with chocolates and cheese. The Wine Room, 96-09 69th Ave.
• Little Neck – 7 to 9 p.m. – Sip, Dip & Paint: A Valentine’s Day Fundraiser for our Animals. Alley Pond Environmental Center, 228-06 Northern Blvd. • Rego Park – 7 to 9 p.m. – Adult Paint & Sip: Winter Night. La Gringa Grill, 63-34 Woodhaven Blvd. • Maspeth – 7 p.m. – Queens Council on the Arts 2019 Gala. Knockdown Center, 52-19 Flushing Ave.
• Elmhurst – 7 to 11:30 p.m. – Chris Cornell Musical Legacy. Blackthorn 51, 80-12 51st Ave.
• LIC – 8 p.m. – A performance of Queen. Variety Boys & Girls Club, 21-12 30th Rd.